David Koepp (Spiderman, The Lost World: Jurassic Park) steps behind the camera for an adrenaline-fuelled action romp that pits two of Hollywood’s brightest stars against each other in a Looney Tunes tale of cat and mouse. 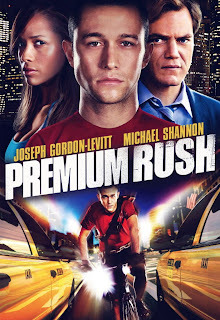 Joseph Gordon-Levitt is clearly coasting it in more ways than one but he brings with him the likeable charm inherent in all his movies. Michael Shannon (Boardwalk Empire) – complete with crazed cartoon laughter – is as engaging as ever in a reliably twitchy, unhinged manner that’s never less than scene stealing. Dodging speeding cars, crazed cabbies, incompetent police officers and eight million pedestrians is all in a day's work for Wilee (see what they did there? ), the best of New York's ‘much loved’ bicycle messengers. 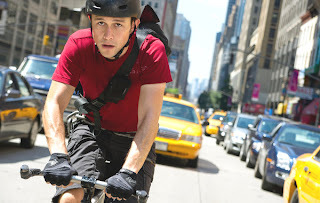 He’s reckless and carefree at the best of times but when his last envelope of the day - a routine premium rush run - turns into a life or death chase through the streets of Manhattan, the phrase ‘putting the breaks on’ becomes even less of an option than usual. Premium Rush races from A to Z in demented fashion, barely pausing for breath as it attempts to cover up the lack of depth, characterisation and plot. Flashbacks provide what little motive there is and a nifty camera trick allows us to step inside Wilee’s mind as he considers the repercussions of his actions; most of which end in gruesome death for him, or somewhat comically, the other road users. The supporting players don’t really have a lot to do but they’re engaging enough, especially the luckless police officer who’s always one step behind.